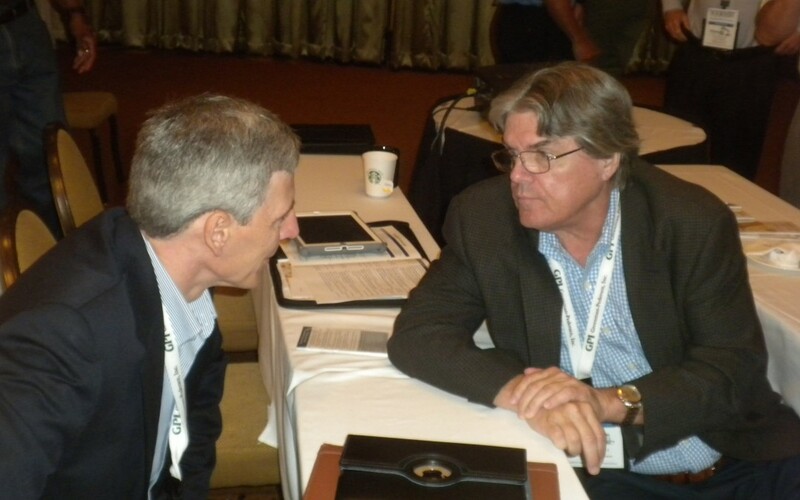 Pete Getchell (right) confers with Caltrans Director Malcolm Dougherty, chairman of AASHTO’s Subcommittee on Construction. Several ARTBA members and staff participated in the annual meeting of the American Association of State Highway & Transportation Officials’ (AASHTO) Subcommittee on Construction August 10-14 in Portsmouth, New Hampshire. ARTBA Contractors Division President Pete Getchell of PKF-Mark III joined colleagues from Walsh/Archer-Western and Pike Industries to share the contractor’s view of risk on alternative delivery projects. Earlier, Oldcastle’s Lee Cole led a detailed discussion on promoting safety and preventing work zone intrusions. The audience included senior officials from 43 state departments of transportation as well as construction policy personnel from the Federal Highway Administration.